I think it would be hard to out do this showstopper Deco kitchen. How do you describe it? Probably the picture says it all. As a design statement this would dominate any interior, and in truth you would need a large room space & ceiling height to benefit from the full impact. In reality it's quite a straight forward idea, just a series of boxes stacked on top of each other. But it is the way they are arranged that makes the design. The focus is totally on the wall units, the base units are typical base units. 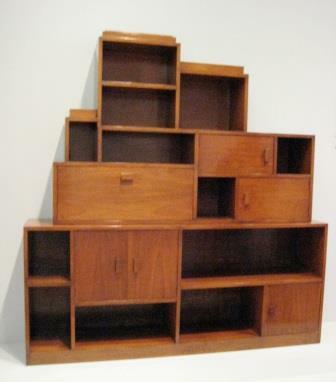 The inspiration for this look was work of Paul Frankl's Skyscraper style, as typified by the bookcase below. You get it straight away when you look at the bookcase & then the kitchen. The impact is emphasised by the contrasting wall colour, which makes the white units stand out even more. The kitchen could equally have been done in dark wood or black, typical Frankl finishes, against a white wall for an equally dramatic look. The doors & drawers are all handleless for a more streamlined look. 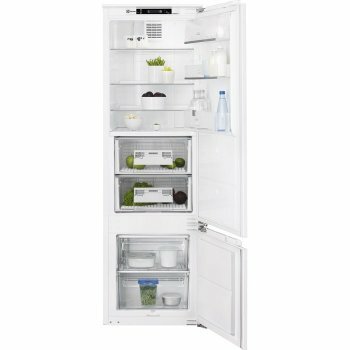 The white lacquered look is very contemporary, but it could be in any colour you wanted. The wall boxes are what initially captures your eye, but the 2 cabinets on the right are interesting as well. 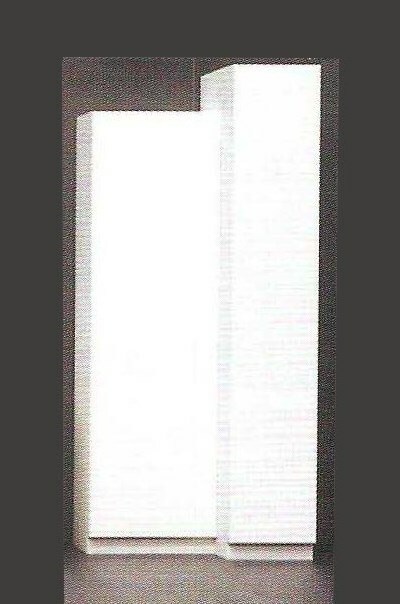 As well as introducing asymetry, they also have the profile of a Skyscraper building in their own right. A kitchen like this is packed full of Deco ideas, that you can adapt & play with for any new kitchen. We'd be happy to design a new kitchen along these lines for you. If we're not near enough to meet up send us the room plan or architect's plans. We can do the design, organise as much as you need & you get your local installer to fit them. 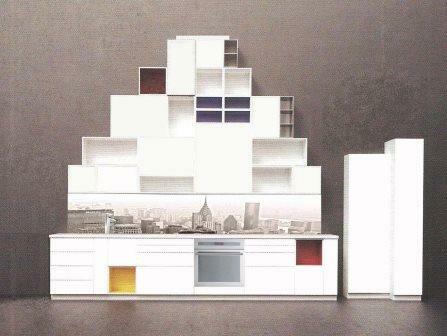 There is a bit of a De Stijl influence in this kitchen as well, with the open colour boxes. This is not as random as it seems, as De Stijl was an influence on 1920's design. The splashback is an interesting touch, with a glass panel backed with an image of New York skyline, further emphasising the Skyscraper look. But some might find it 1 step too far; but it's about offering choice & ideas. Lets face it, your local kitchen company are unlikely to come up with ideas like this. Lets be practical for a moment. This kitchen is all about looks & impact. But you need a very high ceiling to handle it - which is not to say you can't do a less high version, more along the lines of the bookcase. Next point, how do you access the tall units? With a step ladder if they're this high! These cupboards are for storing things rarely used. Also, the stepped shelf surfaces & open boxes can be used for displaying things (pottery being the obvious example). As these are made bespoke we can do basically any option you want or the size you want. The doors & door panels can be painted, lacquered, wood, veneered, mirror, glass, etc.. The worktop equally can be whatever you want, from wood, granite, marble, Corian, glass, etc.. We can also adapt the design anyway you want, and you can also choose any colours or wood, or mix, you want. 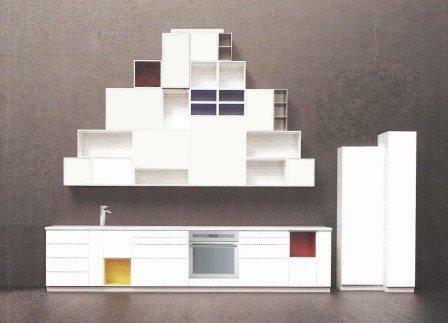 This idea would adapt well to a galley kitchen plan, or L or U shaped kitchens. As it is made to order any elements can be adapted to whatever you want. While the wall boxes are what initially captures your eye, but the 2 cabinets on the right are interesting in their own right. As well as introducing asymetry, they also have the profile of a freestanding Skyscraper building. They house a fridge freezer & 30cm tall pull-out baskets unit, so plenty of storage.